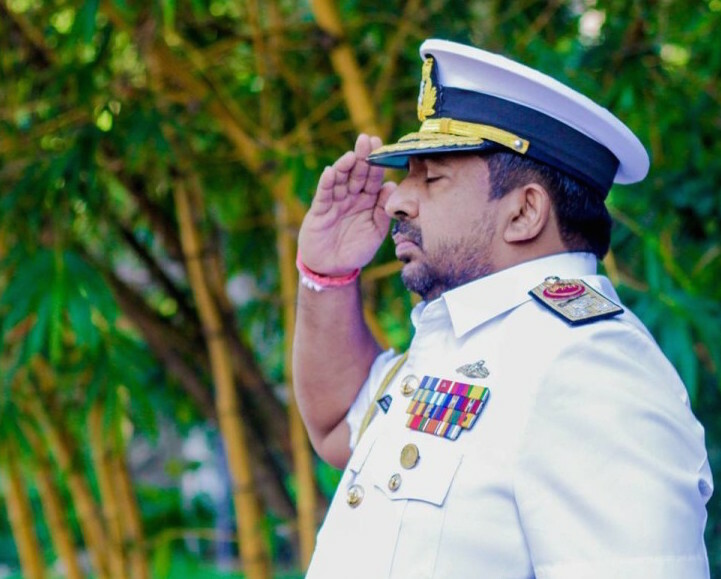 The Navy Commander Vice Admiral Ravi Wijegunaratne is set to get relief of the kind that former minister Mervin Silva got after engaging in acts of thuggery when the victim of the verbal and physical abuse perpetrated by Wijegunaratne pleaded that investigations be stopped. Ranga Kalansooriya, Director General, Department of Government Information told Colombo Telegraph that Roshan Gunasekera, the victim, had intimated to officials of the department who had sought to record a statement by him that he was not interested in pressing charges or having an investigation carried out. Mervin Silva, likewise, got off scot-free on numerous occasions after assaulting people, including journalists. On one occasion Silva even invited the media to watch him tie an official to a tree for not toeing the line. The entire incident was recorded, but in the end the victim pleaded that it was something he had wanted done. Similarly, Wijegunaratne has been caught on video abusing the victim verbally while assaulting him. Kalansooriya, at the time, offered that the journalist had violated professional ethics, essentially justifying the action of the Navy Commander. The assault drew the ire of rights groups and led to protests in Colombo as well as prompted statements from media rights groups abroad condemning the Navy Commander and demanding appropriate action from the Government. Part V: Is Thomas More’s Socialist Society Possible Today? And In What Form? When the Navy was committing cold blooded murders in the north east and even in the south (based on who the CID charged n Rajivr’s)case the Sinhalese had no problem as long as the victims were Tamils or Muslims. Now all of a sudden they are concerned about abuse of power. If I say what I really want to say CT will remove it. So I will leave it to the readers imagination. Are you the burt that is hanging in that Disneyland program ? The way you talk you look like a clown. You say sinhalese have no problem as long as the victims are Tamils or muslims. When your Tamils were blowing up Sinhala people, what did you say, asked for the political solution in order to stop suicide bombers ? If it is will that make you happy? No it was a group of Tamils and they were recognized internationally as terrorists. And we are still asking for it as majority of us do not like violence and we are not stupid like your kind to know that we need peace and stability to prosper. And we are still asking for it .. But you never asked for it when you thought you could bomb and torture you way to victory did you? Oh no such things were quite acceptable when Eelam was the goal. Now that Eelam is a faded dream, you have reverted to bleating about human rights (for the Tamils only of course). Have you ever taken the trouble to sit down and chronologically look at the events that followed since 1983? It is understandable if you are an ill informed ignorant. We cannot help you if you are a card carrying racist. Correction; the timeline goes back to the early fifties at least (and my memory is still functioning well). Then, decent people asked “how long before our Tamil brethren who were goaded would retaliate?” and now we know the answer. 1983 in fact was the watershed. Even if the journalist had violated professional ethics, that still does not justify the action of the Navy Commander!! As to fellows like Jim Softy and Taraki these are Sri Lankan issues that all should have a problem with regardless you being Sinhalese, Tamil or Muslim. I think he had no other choice. To be honest, if I had been the NC, what left on my hand to act the other way around. These men protested did a big harm to the country. But honestly. I am just against he has not asked for an open apology from the nation for the behaviour he made. No it was no like that of a silly act carried out by Mervin the vermin – front man of MR rukada exhibition. The press has gone rabid. They simply do not seem to understand what press freedom is all about. Some act idiotic for the cameras. They MUST be in a luminous red or yellow or blue jacket with “PRESS” clearly printed in white on the front and back. None of them provide any investigative journalism of value but trash depending who pays them, provides advertising revenue or more importantly the bottles. I hated the govt media as it was one sided but since of late they seem to be the most balanced. Ranga Kalansooriya will be exempted from having to wear pants to work from now on. Thoguht the guy was an ideological professional with ethics and a backbone. What a disappointment. Rest assured, the decline of Yahapalanaya has started. Ben Hurling, I concur with every word you say in your last sentence. If you had watched the press conference of Donald Trump it appeared he had spent a lot of time in Sri Lanka. The decline has started and both the President and his Prime Minister are entranced with the echoes of their own voices. Probably the Navy thug’s enforcers would have paid the victim a goodwill visit. Roshan Gunasekera might have been given sensible friendly advice. IF an act of severe intimidation is done in public, irrespective of what the victim says, the State must act. Or the “yahas” will be the same dirty jacket!! Is this dude from Swarnawahini,which is soon to be an asset of Mahendran Family Trust.. It looks that media guy was prepared. he was looking for publicity the wrong way. My opinion it was very good that if he was beaten. I saw Roshan Gunasekera towing a M777 Light Howitzer artillery piece behind him. He was armed and dangerous, anytime he would have blasted the entire Hambantotta to pieces. Timely intervention by the army thug is welcome. This type of buying the small man is a practice that is embedded in the culture of the day .Rohan it needs superhuman effort to ask for justice when the person who mishandled you was not stood down even for a day till the investigation happened ..Yes we support you son ….Change professions quietly not worth getting hurt for to bring awareness in people . Roshan Gunasekera has been made aware in no uncertain terms, as to what will happen to him and/or his employers if he persists in his complaint of assault by the Navy Commander. I concur with the decision of this Journalist. What is the use of pursuing with the complaint, when the Prime Minister accepts a report from the Navy Chief at a ceremony held in his office at Temple Trees and praises the manner in which that operation was conducted. I don’t think Mervyn got that “ceremonial” treatment from his “Bosses”. That should not be interpreted as a favor to him; but compared this Navy Chief – the “Thug” (seen in action in that picture) received all “Ceremonial Greetings” from no less than a person like the Prime Minister of the Country. What a message he sent to the International community? I think he is competing to secure Gota’s rating or above. Wow is this the epitmoy in Sri Lankan Navy poster child pick for a Commander. I suppose he is the shining example of Sri Lankan Navy Seal or sorry my mistake a proud Navy Whale Commando at his peak of fitness. One surprising fact how did he manage to walk the distance unaided let let alone assault any one with all the extra Navy Bulk he has strapped around his belly and & chest.